I’m kicking off the New Year by introducing a wonderful Navajo artist whose jewelry is relatively new to me. 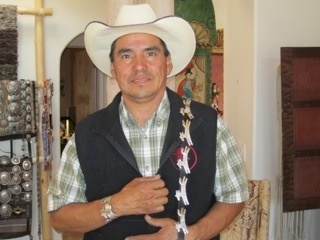 Ira Custer is a jeweler living just outside of Gallup, New Mexico. Although he has been working for several decades, I saw Ira Custer’s jewelry for the first time a couple of years ago, and I was quite pleased at how good it was. 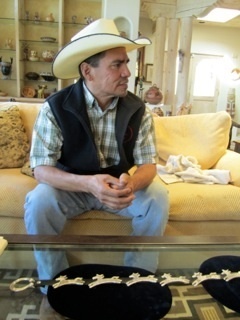 Following in the footsteps of his parents, jewelers Benny and Emily, Ira Custer specializes in the traditional Navajo technique of tufa casting jewelry. Tufa casting (also called sand casting) is a unique technique that fewer and fewer Navajos are doing today. In order to create tufa cast jewelry, an artist first obtains tufa, which is soft volcanic stone. Tufa can be bought, but Ira Custer prefers to cut out his own tufa from a mountain in Greasewood Springs, Arizona, southwest of Ganado. Once an artist has the tufa in hand, they cut it into a block, which is sliced in two parts. Then, a design is carefully hand carved into the inside of one of the halves of the tufa block. After creating a design, the artist affixes the two halves of the tufa back together to form a three dimensional mold. Next, a hole is made in one end of the tufa block, and molten silver or gold is poured into the hole to harden into the artist’s design. Once the metal has hardened, it is removed from the tufa mold with its textured design, and then it is hammered into a final jewelry shape like a bracelet. It takes a skilled jeweler a lot of patience to create good tufa work. It is important to note that tufa rock itself is not hard; it can actually be quite crumbly and difficult to work with. Therefore, an artist never knows how many castings a piece of tufa will achieve. It might only render one piece of jewelry, or if a jeweler is lucky, it could be as many as two or three depending on the quality of the tufa used. When discussing tufa casting, Ira Custer is quick to explain that some people mistake wax casting for tufa casting, but it is not the same technique. Wax casting lends itself to a smooth texture while tufa casting reveals a rough, more organic texture. Ira Custer has won many awards, and examining his work shows that he’s absolutely deserving. I especially enjoy his whimsical animal figures like this horse bracelet, this buffalo buckle, and these two belts – one of a butterfly and one of horses. At Indian market last year, in fact, Ira Custer’s belts were so well received that he sold out of them by 11am on Saturday. I hope that you appreciate Ira Custer’s fine efforts to revive this old technique with his new style.